Ready for a waffle rumble? Eva Sweet sells their Liège waffles out of a food truck, and charges $3 for a waffle without toppings (or at least they did last summer, not sure if the price has changed or not). They have three different flavours – vanilla, cinnamon and maple – and have numerous toppings available at an additional cost. I’ve tried all three flavours without any toppings. The vanilla flavour is a little plain and the maple is a little too sweet for my personal tastes, but for me the cinnamon one is near perfect. The amount of cinnamon is just right. 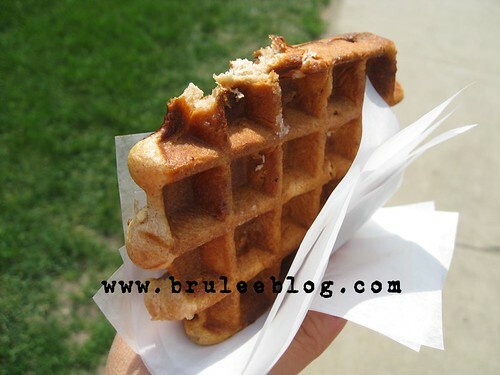 These Liège waffles use pearl sugar, which provides a great caramelized crust. My only issue with the sugar is that sometimes you find chunks of grainy, uncooked sugar inside the dough of the waffle. 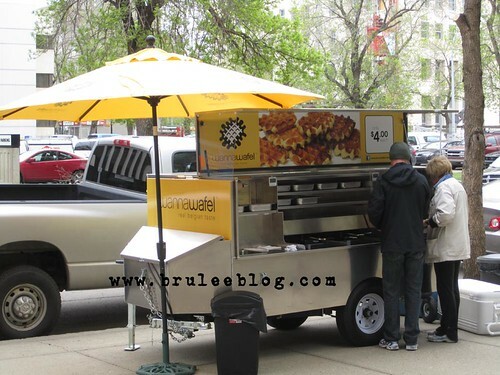 Wannawafel uses a cart, complete with waffle irons. They charge $4 per Liège waffle, and at this point are serving only one plain flavour with no toppings. Wannawafel in Victoria does serve their waffles with toppings. These waffles are made with beet sugar and are a bit smaller than the ones I had at Eva Sweet. 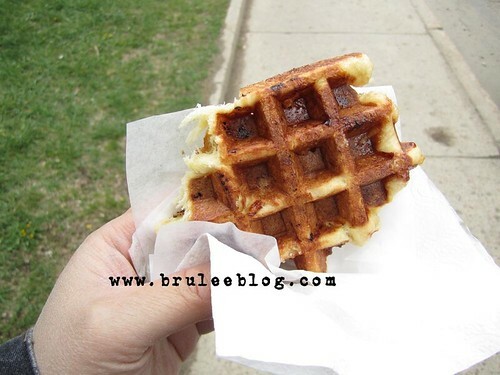 The beet sugar melts and caramelizes very well; there were no discernible chunks of uncooked sugar in the waffle. The dough is a more eggy and light than Eva Sweet’s, but the waffles are less sweet and as a result tastes a little more plain. If you find Eva Sweet’s waffles too sweet, then these waffles are the ones for you. I would be happy with either of these companies’ waffles. I liked Wannawafel’s dough better, but preferred the sweetness and flavour of Eva Sweet’s waffles. Eva Sweet’s waffles are also cheaper. Their location changes a lot, so your best bet is to check their Twitter @evasweetwaffles. 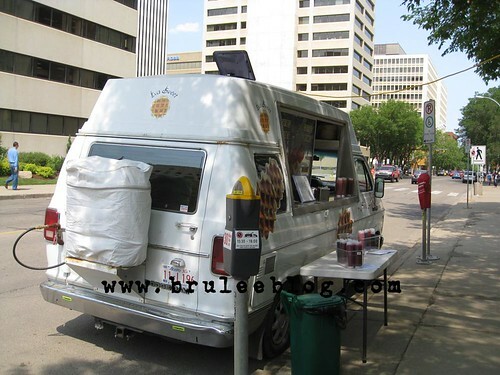 Currently located at 108 St and 99 Ave during the work week. Also planning on appearing at various festivals and events around the city.